A woman at work making dresses in the sewing facility at the FLDS Church's YFZ ranch in Texas. 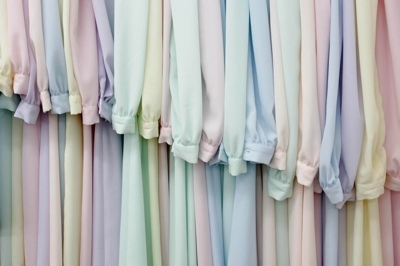 A rack of pastel colored dresses hang in the sewing facility on the YFZ ranch in Texas. ELDORADO, Texas - A new clothing brand may be born out of the Texas raid on a polygamous sect. FLDS women for the first time are offering their handmade, distinctive style of children's clothes to the public through the Web site http://fldsdress.com"Target="_BLANK">fldsdress.com. Launched initially to provide Texas authorities with clothing for FLDS children in custody, the online store now is aimed at helping their mothers earn a living. The venture, which has already drawn queries from throughout the U.S., is banking on interest in modest clothes, curiosity and charity to be a success. "We don't know what to expect on demand but we have had a flood of interest," said Maggie Jessop, a member of the Fundamentalist Church of Jesus Christ of Latter Day Saints. "Our motive is not to flaunt ourselves or our religion before the world. We have to make a living the same as everyone does." The initial Web site featured only photographs of clothes because the children were still in state custody. Now those are being replaced with photographs of smiling, beatific FLDS children modeling the fashions. The sect is offering dresses, overalls, shirts, pants, nightgowns, sleepers, onesies for babies and, yes, ankle-to-wrist underwear. There are denim jeans for boys and "teen princess" dresses in plain, jacket and vest styles in pastel shades of pink, peach, yellow, green, aqua, blue, lavender and lilac. The dresses sell for $35.65. Women's apparel could be added if demand arises. Jessop says Texas Child Protective Services was the inspiration for the enterprise. The department took custody of 440 children from the sect's Yearning for Zion Ranch in early April and eventually placed them in shelters throughout Texas, where they were expected to stay for up to a year. Most children had only a few changes of clothes - long dresses for girls and pants and long-sleeved shirts for boys, covering long underwear. "Some children had only the shirt on their backs, literally," Jessop said. By late April, some children had been told to stop using their unique underwear, and clothing was getting mixed up and lost on laundry days. That added to the pressure, Jessop said, to have the children don "gentile" - regular - clothes. "We said, 'These are our children and this is the way we've chosen to dress them,'" Jessop said. "No way, no way." When CPS said there was no place to buy clothing that met the sect's dress code, the mothers had an answer. "We said, 'Yes you can. You can buy them from us,'" Jessop said. With their children gone, many mothers had idle hands, empty hours and a need to support themselves. "We had to look at what we can do," Jessop said, since the state was "trying to ruin us, almost putting us in a beggar state." "They accuse us of [relying] on welfare, but that's untrue," she said. "We like to be busy and learn to meet our needs - out of ashes growing lilies." Cynthia Martinez, a spokeswoman for Texas RioGrande Legal Aid, said that many of the 48 mothers her firm represents face financial challenges that didn't exist when they lived at the ranch in a communal lifestyle. "Now they are renting homes and apartments and have to figure out how to pay for that," she said. Although the children are back with their parents, legal counsel advised many FLDS mothers to stay away from the ranch until the CPS investigation and action is over. The sewing enterprise allows the mothers to care for their children and support themselves. Sewing expertise is widespread in the community. The women have long made the community's clothes. 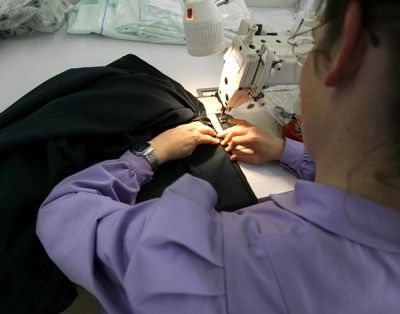 And for many years, the FLDS operated a contract sewing business in the adjoining towns of Hildale, Utah, and Colorado City, Ariz. Called Barco, it made such things as uniforms. Other contract sewing operations flourished, too, said Jessop, who for 20 years ran her own sewing business in Sandy and, later, in Hildale. In Texas, the women have fallen back on the familiar. The enterprise was under way when two Texas courts ordered the state to return the children to their FLDS parents in early June. But the need to support themselves continues, so it is full press ahead. The Web site, sprinkled with scriptural sayings, describes the clothes as meeting FLDS standards for "modesty and neatness" and as being made with "joy and care." "This is not about Wal-Mart quality," Jessop said. "The clothes are washable, durable and children proof." Often described as a "prairie-style" way of dressing in the media, the uniform FLDS fashion has been targeted by critics and cult experts who considered it an example of brainwashing within the sect. The style became widely followed under current prophet Warren S. Jeffs. But sect members defend it as an outward reflection of their values that actually began roughly a decade ago. The transition was gradual, Jessop said. Women wore out dresses that featured floral and gingham prints, flounces and frills, and replaced them with the plain, simple styles seen today. Jessop said the clothing preference is based on Biblical and Mormon scriptural references and a desire to apply those dictates more deeply to their lives. "I really like wearing plain clothes," she said, because it is part of being able to "focus on doing things for others rather than on seeing how darling I can look." Late last week, there were only three women working in what was once a bustling sewing factory at the YFZ Ranch. One was putting together bags of pre-cut fabric that would be sent to women scattered around Texas to assemble in their homes. Two others were piecing together dresses at two of the 30-plus sewing machines. Currently, about 10 to 20 women are involved in the fledgling business, but more will join if demand grows, Jessop said. Income will be shared among all the mothers. And more enterprising efforts are in the works: The group plans to launch a site offering FLDS-made crafts in coming weeks. It will feature CDs of members like Jessop singing songs for children, children's books written and illustrated by FLDS members and cookie and recipe books. "Since the State of Texas has taken our support system, we can do the best we can to make up the difference," Jessop said.